Getting around The Villages with ninety plus miles of golf cart paths to follow and navigate with no signs or directions can be difficult. Until now!! A fantastic new GPS app dedicated to helping get you around is available for Apple and Android devices. Visit www.VillagesGPS.com to learn more. If you like golf then you will love living in The Villages. There are 12 immaculately kept championship golf courses, 38 executive courses and 4 practice facilities in The Villages. Lifetime country club memberships to the championship courses are included for Village residents and walking the executive courses is free! 12 Championship Courses with 306 holes. Currently there are 648 total golf holes making The Villages the largest single golf community. There are 300 par three holes of golf in The Villages. There are 30 par 4’s on Executive Courses. There are 147,896 yards (85 miles) of golf available in The Villages (from back tees) Championship Golf Holes total 52 miles and Executive Course holes total 31.2 miles. Cane Gardens – Allamanda/Jacaranda (3606/3583 yards) from the back tees is nine yards longer than Palmer Legends’ Cherry Hill/Laurel Valley (3541/3639 yards). With 12 Championship and 38 Executive Golf Courses The Villages exceeds the second largest golf facility in the world, Mission Hills in China, which as 216 holes. Total shoot-your-age rounds in The Villages 1500. 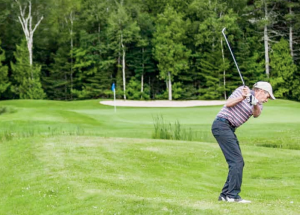 About one-third of Villages residents are regular golfers. Playing 36 holes per day, a Villager could play 16 straight days of golf in The Villages without repeating a hole. 2,950,000 rounds of golf were played last year with an average of 6 hole-in-ones per day! There were 717,124 championship rounds of golf played in The Villages. Average rounds of golf were 57,370 per course which is almost twice the nationwide average. There were 1,829,340 executive golf rounds played in The Villages. 9 hole golf courses averaged 59,192 rounds of golf. Executive golf rounds played in The Villages were 3.5 times the national average.